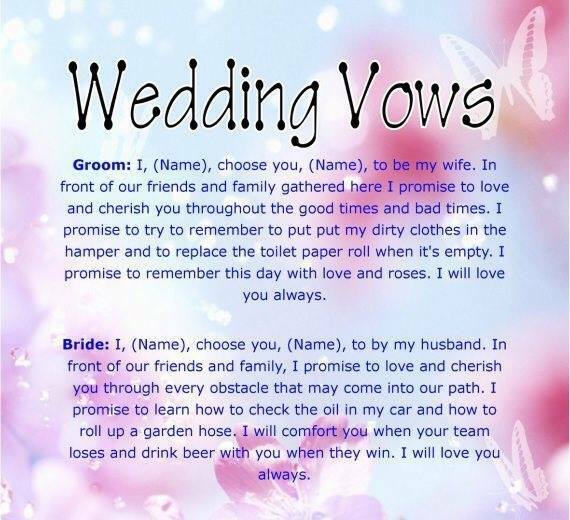 WEDDING VOWS GROOM: I, (NAME), CHOOSE YOU, (NAME), TO BE MY - ProudMummy.com the Web's Community for Mums. WEDDING VOWS GROOM: I, (NAME), CHOOSE YOU, (NAME), TO BE MY WIFE. IN FRONT OF OUR FRIENDS AND FAMILY GATHERED HERE I PROMISE TO LOVE AND CHERISH YOU THROUGHOUT THE GOOD TIMES AND BAD TIMES I PROMISE TO TRY TO REMEMBER TO PUT MY DIRTY CLOTHES IN THE HAMPER AND TO REPLACE THE TOILET PAPER ROLL WHEN IT'S EMPTY. I PROMISE TO REMEMBER THIS DAY WITH LOVE AND ROSES. I WILL LOVE YOU ALWAYS. BRIDE: I, (NAME), CHOOSE YOU, (NAME), TO BE MY HUSBAND. IN FRONT OF OUR FRIENDS AND FAMILY, I PROMISE TO LOVE AND CHERISH YOU THROUGH EVERY OBSTACLE THAT MAY COME INTO OUR PATH. I PROMISE TO LEARN HOW TO CHECK THE OIL IN MY CAR AND HOW TO ROLL UP A GARDEN HOSE. I WILL COMFORT YOU WHEN YOUR TEAM LOSES AND DRINK BEER WITH YOU WHEN THEY WIN. I WILL LOVE YOU ALWAYS.